It’s time to face facts. Gigantic wallets are a thing of the past. You don’t need to carry around two dozen membership cards, a roll of photos of family members, half a dozen credit cards and debit cards, a driver’s license, a boatload of cash, receipts from a gas station from two years ago, or the limp of business cards that have been sitting in that one pocket of your huge trifold wallet since, well, you can’t remember when. It’s time to move on. And there’s a reason people used to favor large wallets. Before the rise of digital technology and cashless, advanced systems, you often needed to haul around quite a bit of information with you – membership numbers, business cards for people you need to remember to call, receipts so you could remember what you’d spent, and so on. But nowadays, business cards are a thing of the past – take a quick picture with your smartphone and toss it in the trash. You don’t need receipts, except to check that the credit charges were right, because you can just check the online balance of your bank account or credit card and see all the charges. You don’t need to carry much cash because almost every establishment accepts credit cards, and some of your credit cards can be used directly from your smartphone with apps like Apple Pay and Google Wallet. 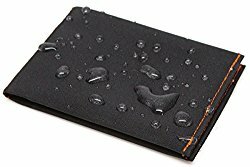 All of these factors have helped make small wallets much more popular in recent days, and whether you’re looking to make the switch from your gargantuan back-pocket-warmer, or simply looking for a new, stylish alternative for your current wallet, we’ve rounded up a choice selection of the best small wallets on the market today. For your convenience, we’ve listed our top picks, along with some basic information about each one, below. Take a look to get an idea of our styles and picks at a glance, then feel free to move on to our detailed breakdown. On mobile devices: If data is cut off, the table can be scrolled horizontally. 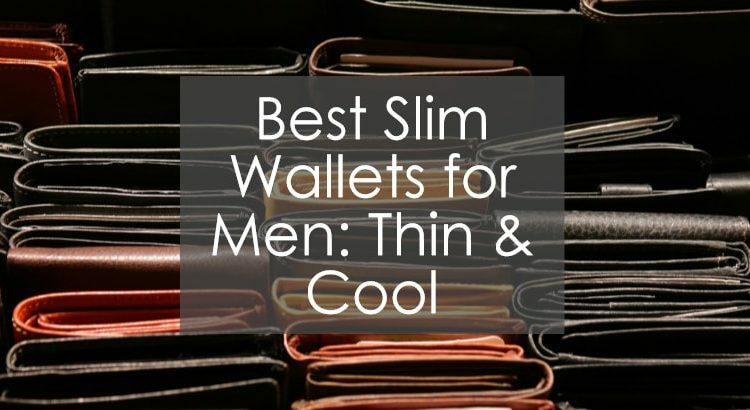 Thin wallets offer a great balance. 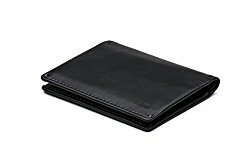 Unlike larger versions of bifold and trifold wallets, they’re slim, subtle, and won’t take up too much space, and unlike even more minimalistic options like ultrathin cardholders and money clips, they offer ample protection and expandability so that you can always carry just what you need to, and no more. 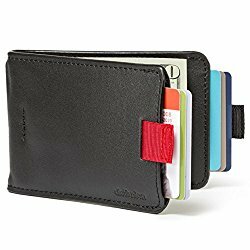 Panicking about being able to fit all your stuff into a slim wallet? No sweat. While these wallets may be slim in design, they can still hold a surprising amount of stuff. They simply do away with a lot of the extra, unnecessary features that so many larger wallets have. If you really need the storage space, you’re sure to find a wallet on this list that will do the job for you, while still being much smaller than what you were using before. And of course, if you’re looking to cut down on what you’re carrying, there are plenty of minimal options here for you as well. You’re sure to find the perfect pair to your pocket in one of our slim wallet picks. Some may not like the unique, vertical trifold design. Summary: This Secrid Slim Wallet incorporates a unique design with premium materials to create a world-class minimal wallet. The vertical trifold design gives you two generous card pockets, as well as a currency pocket that can accept quite a few unfolded bills. It also incorporates RFID blocking technology, so you won’t have to worry about anyone skimming your cards for info from your chips, or gaining illicit access to data off of your smart cards. The unique construction incorporates genuine leather that’s pliable to the touch and durable, wrapped around a high-quality aluminium card case that both helps protect your cards from bending and aids in the RFID-blocking capabilities of this wallet, and it manages to pack all of this functionality into an attractive and functional package that’s only 14mm thick. And if you’re looking for high capacity, the Secrid Slim Wallet is no slouch in that department. Up to 12 cards can be stuffed into these expandable cardholder pockets, and you can even stash a couple bills in the currency pocket. And the design of this wallet means you never have to worry about damaging your credit cards by packing them in too tight and then bending them, giving you peace of mind even if you need to carry quite a bit of stuff in your wallet. Overall, it’s a great blend of cardholder utility and minimalism, high quality construction, and plenty of storage options that make this case such a versatile and attractive option. See our full review of Secrid wallets. Summary: This slim sleeve style wallet by Bellroy combines a beautifully stitched, well designed vegetable-tanned leather exterior with a ton of storage options and useful features that make it a great slim wallet for anyone looking to keep themselves organized. It also comes in almost a dozen different colors with contrasting interiors and stitching. Four total slots can hold both cash and cards, two that are pocketed within the body of the wallet, and two on top of those. This design lets you pick your most used cards and keep them front-and-center, ensuring you’ll always have easy access. The interior pockets can hold either cards or cash, and one of the pockets has a unique “pull-tab” design that helps you gain easy access to your less-used cards, even if you pack them away tightly within the internal pocket. The exterior pockets can hold about two cards each, and the interior pockets about 4, or several paper bills folded in half. Total capacity is about 12 cards without cash, and more like 8-9 cards if you plan on carrying a good supply of bills with you. This wallet earns high marks from us for incorporating smart design, great materials, and plenty of storage capacity into a wallet that’s classy, convenient, and beautiful to look at and handle. Our only gripe would be that it’s a bit pricy, but most of that price goes directly into the high quality materials – this is a wallet that can easily last you decades if you treat it right, and you can feel that when you touch the premium leather and stitching. Also see our comprehensive review of Bellroy Sleeve Wallets. Summary: This SlimFold MICRO Soft Shell Wallet is handcrafted with a durable synthetic microfiber materials that was developed in San Francisco which is abrasion resistant, water-resistant, stain-resistant, extra durable, and much thinner than standard leathers, all stitched together with high-quality ballistic thread to create a wallet that’s incredibly thin, durable, and convenient to use. The design is a bifold, incorporating two interior card slots, including an ID slot with a mylar window to hold your ID or other important card. A cash slot takes up most of the rear of the wallet, but it hides two extra interior pockets, where you can place cards that you don’t use as often, allowing easy storage and compartmentalization of your most important items. The ID pocket is best used for a single card, but the others can hold 2-3 cards apiece, giving you a total of about 8 card storage slots if you’re planning on carrying some cash with you. The bifold design incorporates a dedicated cash pocket that’s big enough not only for US dollars, but UK pounds, Euros, Canadian dollars and a variety of other foreign currency. The flexible yet strong technical synthetic microfiber can stretch to accommodate more cards, yet will always maintain its shape once your items are removed. The material itself is only .5mm thick, so even with a large number of cards and some cash in the wallet, it’ll still clock in at quite a bit slimmer than most more traditional leather wallets. If you’re looking for a wallet that’s radically different that most leather bifolds and slim wallets on the market, you will probably love this SlimFold MICRO. It’s slim, stylish, and durable, and has plenty of storage while maintaining a low profile and light weight. However, if you’re more of a traditionalist and you like leather and natural material, this probably isn’t the wallet for you. Visit our full review of Slimfold wallets. Summary: Maybe you’re not totally sold on the idea of a slim wallet. Maybe you need to carry a ton of stuff with you, and nothing we can say about minimalism or convenience can change your mind. That’s fine! There’s still a wallet for you that combines a slim design with absolutely immense storage capacity, and that’s the Distil Union Wally Bifold – Slim Wallet. The unique design makes use a unique bifold design featuring two exterior card pockets that can be stuffed with up to six cards each, and features a “Wally Pull Tab” on the exterior, which activates a mechanism that slides your cards out to you for easy access, avoiding the fumbling problems when can come along with high-capacity card storage slots. And instead of an interior cash pocket, which most high-capacity bifolds use, the Wally Bifold makes use of a unique combination money clip design which can hold up to 30(!) US bills, unfolded and ready to go. In addition, the tension of the money clip is adjustable, which allows you to tune it to your preferred paper money storage capacity. These storage features help make this wallet super slim by avoiding the “crunch effect” often found in bifold wallets when they’re packed with tons of stuff – the contents are not kept parallel, meaning they will meet in the center of the wallet and jut up against each other, causing the ends of the wallet to flare out, and make the overall profile of the wallet much larger. By using the money clip design and the exterior storage pockets, this slim wallet keeps all of your cash and cards totally parallel, and keeps the “crunch effect” from occurring. The build quality is great, with full-grain leather and high quality stitching, as well as the aforementioned “Wally Pull Tabs”, which are made of a durable textile that feels great to use, and will certainly hold up over prolonged use. 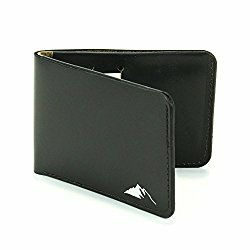 If you demand a high capacity wallet, but are looking for a slim profile, this is certainly the wallet for you. However, some traditionalists may not like its design, with the limited card storage with pull tabs and single money clip design offering relatively few organization options. However, if storage is your number one concern, you won’t go wrong with the Distil Union Wally Bifold. See the full Distil Union review. Summary: This Secrid Twin Wallet can be thought of as the “big brother” to the Secrid Slim Wallet. As the name suggests, it incorporates two of the high-quality aluminium card cases that the Secrid Slim Wallet uses, and surrounds them with a supple and pliable leather, closing with a snap closure. It maintains the same design of the Slim Wallet, with the two card holders separate from the cash slot in a tri-fold design, with cash slots located on the opposite side of the card holders. While it’s advertised as holding 16 cards, we find that raised lettering makes the maximum capacity of this cardholder more like 14, especially if you plan on keeping a stash of cash in the pockets. Its high capacity is augmented by a very secure hold on your cards that still releases easily when you need access to them, and the button closure helps keep the wallet from opening in your pocket, or falling open when you’re taking it out. Our one concern is that while it maintains a fairly slim profile, it still clocks in at about twice the height (24mm) of its little brother, the Secrid Slim, so the rigid aluminum combined with this tall can present uncomfortable problems for those who prefer to carry their wallets in their back pocket. Organization options are also limited for a wallet with such high capacity. If you don’t mind the height, or don’t carry your wallet in your back pocket and are looking for huge storage capacity, this wallet is high quality (and comes with a price tag to match), but it’s unparalleled if you’re looking for maximum security, storage, and style. 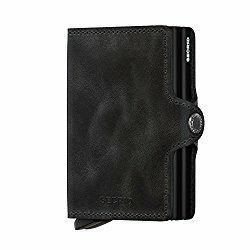 This Exentri Trifold Leather Wallet with Locking Device is another offering that manages to pack huge storage capacity into a relatively slim profile by using smart card storage options and a trifold design, and it incorporates a stainless steel locking mechanism to keep your cards and cash secure. It’s well built, made from Italian leather and stainless steel, and stitched together adeptly, making it both stylish and durable. 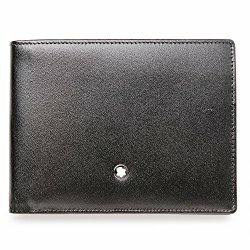 It contains seven total card pockets, two of which are accessible without opening the wallet, and can be accessed either from the top or by using the built-in thumb hole to push them out, making it very convenient indeed if you need to carry a bunch of cards, but only use 2-4 of them frequently. It does lack a full ID window, but it more than makes up for that fact with its gigantic storage capacity. You can easily fit 10+ cards in this wallet, along with a large stash of cash. Now, all of this storage is packed into a slim profile, and you’ve got tons of organization options, but if you fill it to max capacity you’ll find that it’s quite bulky, making it inappropriate for rear-pocket wallet users. This is just an unfortunate fact – there’s no such thing as free storage. All of the bulk has to go somewhere. However, if you’re a front-pocket wallet user who needs tons of storage capacity and organization at a reasonable price, we can’t recommend this product highly enough. It’s durable, reliable, secure, and convenient. Summary: Bifold lovers rejoice! This bifold wallet by Hammer Anvil is perhaps the best low-profile bifold wallet we’ve ever had the pleasure to review. It packs a multitude of features – RFID blocking, four different card slots including a quick access slot on the front, an ID window, an oversized receipt/business card slot, and a full-bill capacity rear storage slot into a package that’s as beautiful as it is functional, made out of subtly designed and high quality leather. Fully loaded, you can get about six cards into this wallet easily – two in the front storage compartment, one in the ID slot, and one in each of the card slots, as well as plenty of cash in the rear storage compartment, or even more cards in the receipt/business card pocket, if you’re feeling like really loading it up. 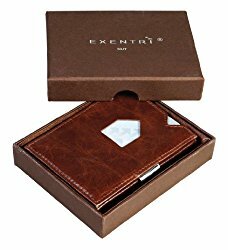 It also features RFID blocking technology built into the leather and lining, making it safe to keep your smart cards and chip cards inside. And even when fully loaded, this wallet manages to avoid the “crunch effect” caused by overstuffed wallets, with a smart design made out of thin, yet high-quality leather stretching just enough to accommodate all of your stuff. While it is expensive, if you’re a die-hard bifold fan looking for something that’s low profile, classically designed, durable, and extremely high quality, you’re not going to find a better bifold wallet. Summary: The Montblanc Meiserstuck is as simple as it is elegant. High quality calfskin is stitched to perfection in this wallet, which is branded with a subtle logo and embossed metal stud on the front. Six card slots are contained within, each of which can hold two cards. A cash pocket on the rear of the wallet is lined with high-quality textiles, and can hold quite a few bills and other miscellaneous items. This wallet is designed with a slim profile, but it is rather wide and long. Overall, it’s still much smaller than competitive offerings, but its width and length combined with a low-profile height make it more appropriate for rear-pocket wear, as opposed to front pocket wear, where you may encounter pocket size issues. And while it has plenty of storage options and capacity, organization options and features are quite lacking for a wallet that’s this expensive. It’s top quality and beautiful to look at, but some may be turned off at the high price combined with the simplistic, minimal design. Overall, if you’ve got the money to spend, and you’re interested in a minimal aesthetic and incredibly high quality, imported materials, this may just be the bifold for you. If not, we recommend checking out the Hammer Anvil Men’s RFID Blocking Genuine Leather Slimfold Wallet above, as it has many more storage options and special features. See our full Montblanc review. Summary: This Horween leather wallet by Rugged Material may just be the best bargain on our list. At a low price, it offers a Horween leather, – a specialty leather often used for boots that’s 3-4x thicker and more durable than standard full grain leathers – a beautiful, rugged design, tons of storage options, and even RFID blocking technology. Constructed out of a single piece of leather, this wallet is made in a minimalist design that incorporates two internal storage pockets, four card slots, and a large, easily accessible cash storage pocket in the back that’s totally separated from your card slots. 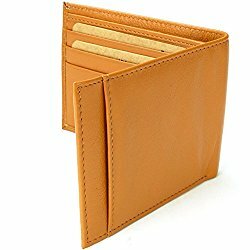 The durable and expandable Horween leather storage pockets can easily hold six cards in each side, with multiple storage and organization options, and the rear billfold can hold plenty of cash, making this a very versatile wallet indeed. Rugged, simple, and a great bargain, we’d recommend this to anyone looking for a bifold wallet that can stand the test of time, take plenty of abuse, and look darn good while doing it. 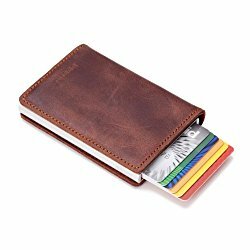 As you can see, there are many different options when it comes to slim wallets, including cardholder designs, bifold and trifold designs, and other, even more unique styles and options. So whether you’re a maximalist and a minimalist, we’re sure there’s a wallet on our list that can help you decrease the bulk of your pockets, while still giving you plenty of storage and organization options for your everyday essentials. We recently also published a review on Flowfold wallets. Feel free to check it out. And if you’re still not sold on these more minimal wallets, why not check out our reviews of bifold wallets?